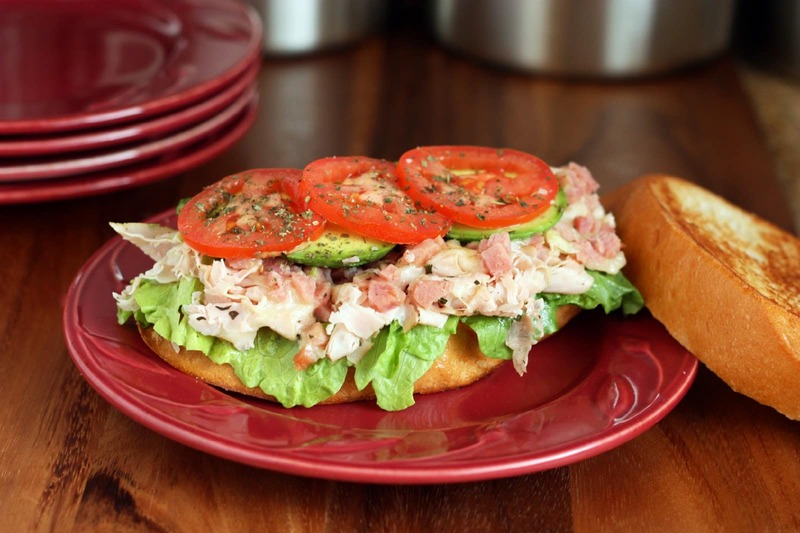 Build your own fancy deli sandwich at home! 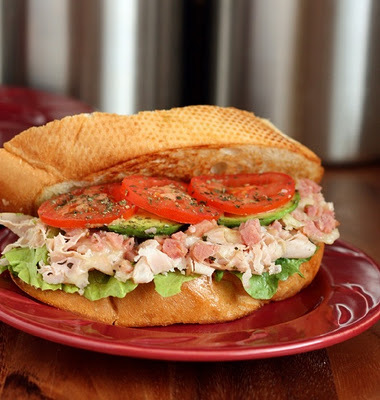 This sandwich is incredible, simple but incredible! It’s loaded with turkey and ham, don’t you hate the sandwiches that are so skimpy with the meats? It’s the centerpiece of the sandwich. With that said, please use quality meats if you don’t you’ll get a low quality sandwich. 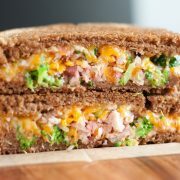 I had two friends tell me this was one of the the best sandwiches they’ve ever had so there’s two reviews for you =). My favorite thing about this sandwich is that it gives me the perfect use for my left over spiral sliced ham. I often dice any ham we have left and freeze it. If I’m really lazy about it I will even do it in the food processor, although I do prefer it diced by hand because you can determine the size of the dice. It just takes a bit longer. 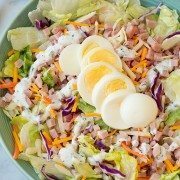 I also used my left over ham for ham and cheese salads, ham eggs, or ham pizza. So don’t through that left over ham out, there’s hundreds of uses for it and it freezes so well. 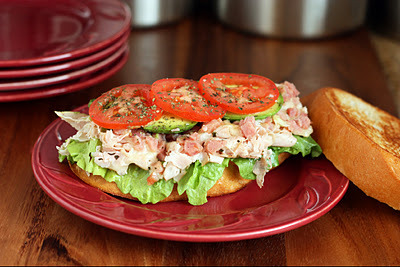 Easy to make sandwich filled with both turkey and ham and toasted to golden brown perfection. Heat a large non-stick saucepan over medium low heat. Butter pan and toast one (or both side if preferred) of each slice of bread until toasted and golden. 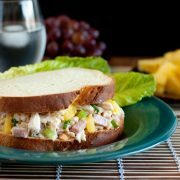 Remove bread from heat and dress bread with mayonnaise, whipped cream cheese or mustard as desired, top one slice with lettuce and set aside. Return pan to heat, butter pan again and layer turkey slices into pan. Cook turkey until lightly golden on bottom (only takes about 1 minute), then flip turkey using a spatula. Remove from heat and top turkey with shredded Mozzarella cheese, sprinkle with ham, then layer with avocado slices, followed by tomato slices, then sprinkle with with Italian seasoning. Return to heat and cook until cheese has melted and bottom of turkey is lightly golden. Using the spatula, carefully lift out layered sandwich filling and lay on top of sliced bread containing lettuce. Top with remaining slice. Serve immediately (you may want to cut it in half to be able to eat this one =).